Journal of Virtual Reality and Broadcasting, 12(2015), no. 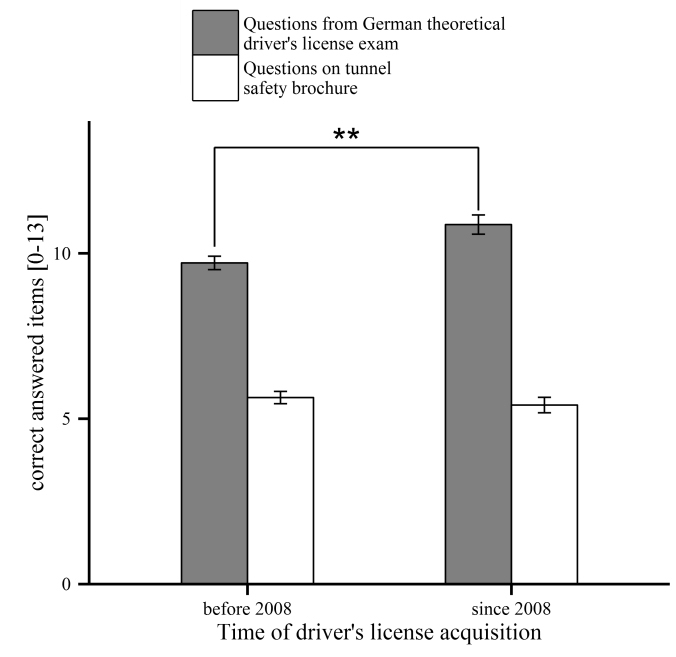 3.: Human behavior is a major factor modulating the consequences of road tunnel accidents. We investigated the effect of information and instruction on drivers’ behavior as well as the usability of virtual environments to simulate such emergency situations. Tunnel safety knowledge of the general population was assessed using an online questionnaire, and tunnel safety behavior was investigated in a virtual reality experiment. Forty-four participants completed three drives through a virtual road tunnel and were confronted with a traffic jam, no event, and an accident blocking the road. Participants were randomly assigned to a control group (no intervention), an informed group who read a brochure containing safety information prior to the tunnel drives, or an informed and instructed group who read the same brochure and received additional instructions during the emergency situation. Informed participants showed better and quicker safety behavior than the control group. Self-reports of anxiety were assessed three times during each drive. Anxiety was elevated during and after the emergency situation. The findings demonstrate problematic safety behavior in the control group and that knowledge of safety information fosters adequate behavior in tunnel emergencies. Enhanced anxiety ratings during the emergency situation indicate external validity of the virtual environment.